We are delighted to announce a themed collection on “Dendritic polymers for smart drug delivery applications”, to be published in Nanoscale in early 2015. The collection will be Guest Edited by Professors Marcelo Calderón and Jayant Khandare. We welcome your high quality research contributions for this exciting collection. Hyperbranched polymeric materials at nanoscale dimensions have concomitantly broadened the field of biomedical applications. Dendritic polymers are classified as: (a) perfect dendrimers, (b) dendrons, (c) dendronized polymers, and (d) hyperbranched polymers. Perfect dendrons and dendrimers are unique nanosystems because they can be expected to achieve monodispersity, nanometer dimensions, low viscosity, multiple functionality at the terminal groups, high solubility, and biocompatibility. Dendritic polymer architectures show significant advantages over linear polymers for many delivery applications. For example, the defined multivalency of dendrimers can be used to encapsulate or conjugate multiple drug molecules while allowing the controlled addition of targeting, imaging probes, and/or solubilizing modalities. The synergy between their multifunctionality and size on the nanoscale enables a chemical smartness along their molecular scaffold that achieves environmentally sensitive modalities. Therefore these functional materials can be expected to continue improving the existing therapeutic practice. This themed collection will include high quality articles highlighting developments in the field of dendritic polymers, their applications as controlled delivery of drugs and for diagnostic implications. All submissions to the journal are subject to rigorous, fair peer review against our usual very high standards, and if accepted for publication will benefit from high exposure. 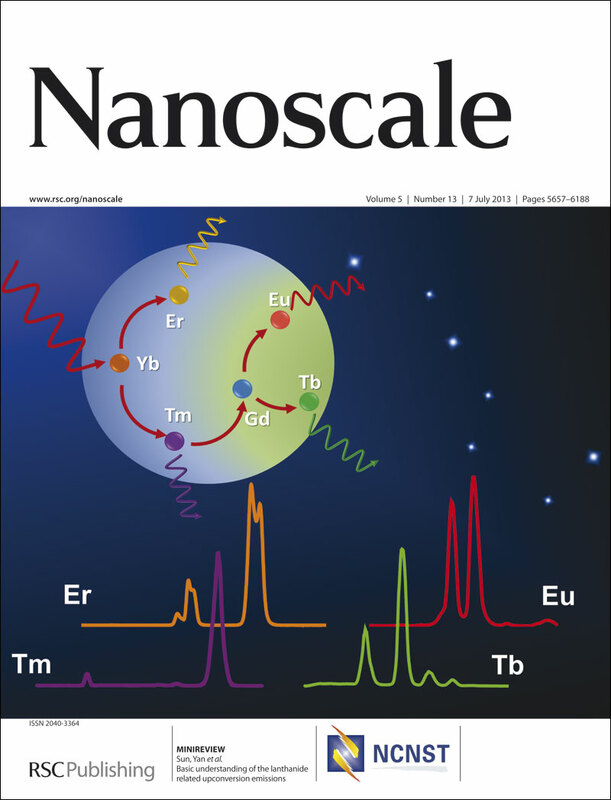 Manuscripts for this Nanoscale themed collection can be submitted in any reasonable format via our online submission service. Please indicate upon submission that your manuscript is intended for this themed collection. Nano-structured carbon materials are key components for building advanced composite electrode materials which demonstrate intriguing properties. This makes carbon materials important electrode materials for energy storage devices, and provide the possibility to design versatile energy-related devices. Nevertheless, optimization of the distribution of various nano-structured carbon within the electrode matrix is needed and further analysis of the role of carbon species within the electrode matrix is required. In this Nanoscale paper, Chang Yu, Jieshan Qiu and co-workers at the Dalian University of Technology, China report in detail on the effects of carbon species within the electrode matrix on the electrochemical activity, in terms of pore structure, conductivity, and surface chemistry of carbon materials. Advances in nanomaterial production for device implementation, biotechnology and biomedical areas require methods to measure the possible health and safety risks associated with nanomaterials exposed to a particular biological environment. In this manuscript, researchers from the Health Research Institute, Japan, investigate the environmental toxicity of engineered CdSe quantum dots (QDs) and ZnO nanopowder (NP) in human lung cells. To evaluate the toxicity, the researchers induce the breakdown of the nanomaterials by exposing them to simulated solar UV light. This releases Cd2+ and Zn2+ ions for the QDs and NPs, respectively, which were then detected by measuring the quenching of the fluorescence signal in the presence of tetrakis (4-carboxyphenyl) porphyrin (TCPP) or by measuring the enhancement of the fluorescence signal in the presence of the commercial Measure iT Pd/Cd sensor. The researchers conclude that Cd2+ and Zn2+ ions are not cytotoxic at low concentrations and for short UV exposure times but become toxic at longer exposure times, i.e. 72 hours or longer. In addition, cells exposed in the long term to Cd2+ ions result in extensive DNA damage as measured by comet assays and gel electrophoresis. This manuscript details the importance of measuring the health and safety aspects of engineered nanomaterials, in particular the environmental impact of released meal ions, exposed to UV light. The Chinese Society of Chemical Science and Technology in the UK (CSCST-UK) is professional organisation organised by Chinese Scholars currently working in the UK. It was established in April 1994 in London with the help of the Education Section of Chinese Embassy in the UK. The society aims to promote academic communications among members and strengthen academic exchange between UK and China. Sign up to receive our free Nanoscale table-of-contents e-alert to keep up to date with each issue as it is published. 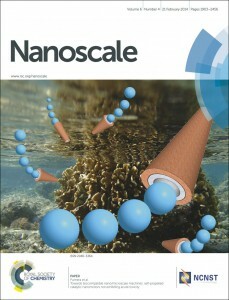 We invite you to submit your best research to Nanoscale. Chinese scientists have made compact, self-powering, bendable photodetectors from tin dioxide cloth. Flexible electronics are an exciting area of research with foldable displays and wearable electronics being potential uses. Self-contained power generation complements flexibility by removing the need for bulky external power supplies to make smaller devices more feasible. Guozhen Shen from the Chinese Academy of Sciences, and co-workers at the Wuhan National Laboratory for Optoelectronics, have made tin dioxide cloth by growing tin dioxide nanoparticles on a carbon cloth template to give hollow microtubes of tin dioxide in a woven pattern. Tin dioxide is a wide band gap semi-conductor that has high quantum efficiency in the UV region, making it a good material for both battery electrodes and light sensing. Shen’s team integrated a tin dioxide cloth-based UV photodetector and a tin dioxide cloth-based lithium-ion battery into one device to form a flexible, self-powering photodetector that can be trimmed to match any shape. The detector’s performance is comparable to conventional devices and, importantly, no change in performance occurs when the cloth is folded. Read more in the Chemistry World article by Emily Skinner. In this article, researchers from Southwest University, China, investigate the size-dependent nature of the localized surface plasmon resonance (LSPR) of silver nanoparticles (AgNPs) using a combination of darkfield microscopy (DFM), scanning electron microscopy (SEM) and UV-Vis spectroscopy. cyan, yellow, and red light, respectively. In addition, the researchers adsorbed small alkanethiol molecules on the surface of the various nanostructures in order to test their viability as nanosensors. By measuring the change in the λmax before and after the addition of the small molecule, the researchers concluded that the nanorods offer the greatest degree of sensitivity. The authors have reported a simple method whereby AgNPs of different shapes and colours can be synthesized and utilized as multiple labels, in a similar fashion to quantum dots, in bioassays and imaging. The initial idea, fueling part of the push for nanotechnology, was that electronic circuits could be self-assembled by choosing the correct combination of molecular building blocks. This paper from the group of Oren A. Scherman at University of Cambridge shows how small molecular circuits with gold contacts can be self-assembled. Molecular interactions between cucurbiturils hosts and two—an electron deficient and an electron rich—guests allow for the end-to-end linking of multiple gold nanorods. 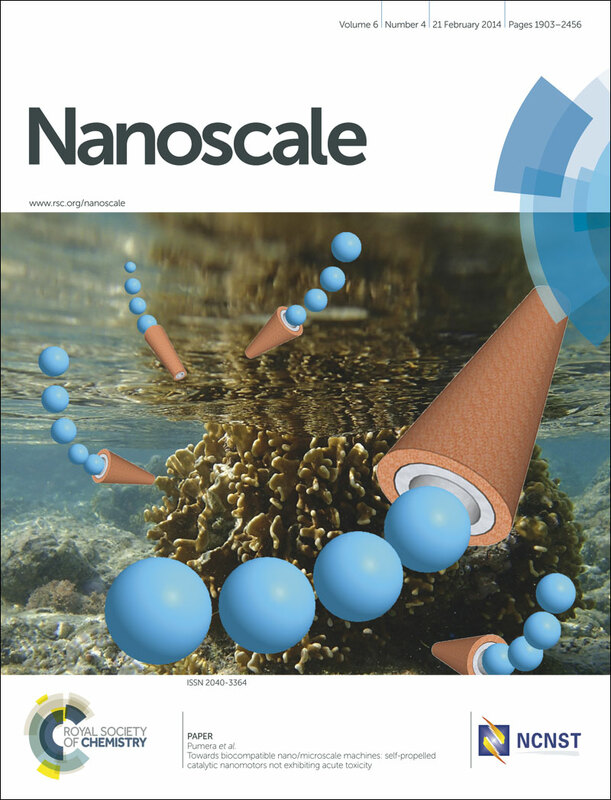 While several examples of end-to-end linking of gold nanorods have been published, see for example work by Kumar and by Jain, this supramolecular approach is interesting as it allows for processing in water. It will be interesting to see what the next paper will bring. Is the next step more complex self-assembled structures or to investigate the potential of these structure by contacting the gold nanorods and investigating the electron transport characteristics? Research published in Nanoscale describes the development of a micro-woven tin oxide cloth that enables the design of flexible, self-powered detectors for environmental monitoring. Chinese scientists fabricated the material, which acts as both a battery anode and a light sensor, using a sacrificial carbon cloth as a template. The team used this to grow tin oxide nanoparticles which form hollow tubes identical in structure to the woven carbon when the carbon cloth is removed at high temperatures. Tin oxide is a wide band gap semi-conductor with high quantum efficiency in the UV region, making the material a good substrate for both battery electrodes and light detection. The scientists showed that two of the tin oxide layers can be integrated into one highly flexible, self-powered photodetector that shows comparable performance when compared to non-foldable devices with external power supplies. No change in light detection or power generation occurs when the cloth is folded. Hao Dong, Ling-Dong Sun and Chun-Hua Yan review the energy upconvertion potential of lanthanide doped minerals, in bulk and in nanocrystals/nanoparticles. The plethora of excited state in lanthanide ions can be exploited in single metal energy upconverters and in multimetellic systems, where the number of populated excited states is increased significantly. 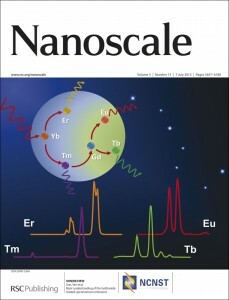 The paper is an excellent starting point for the people interested in lanthanide energy upconvertion. My first encounter with energy upconvertion was for thulium ions in solution, where high fluency irradiation made several processes possible, which never would take place in the world of linear photophysics I usually inhabit. The possible processes multiply in nanocrystalline matrices with multiple lanthanide ions present. Dong et al. have kept their sights straight and produced an concise account of the possible mechanism for energy upconversion and on how to identify them. The road to a low fluency energy upconverting system may prove to be long, but papers like this makes sure that it will be interesting. Researchers in Korea have developed a new temperature sensing platform based on graphene oxide (GO). The sensor uses GO’s functionality as an efficient Förster resonance energy transfer (FRET) acceptor to deliver a fast optical on-off signal in response to temperature change. The article describes how the scientists functionalised GO sheets with thermally-responsive triblock copolymers for the first time. The triblock copolymer brush was designed to contain a component for covalent grafting to GO, a thermally-responsive component and a fluorescent component. At elevated temperatures, the thermally-responsive component (poly(N-isopropylacrylamide) undergoes a conformational change that reduces the distance between the fluorophore and GO. This quenches the photoluminescence (PL) of the flurophore component. The scientists tested a dispersion of the functionalised GO sensing platform in water. PL spectra showed a decrease in intensity as the temperature was increased. A marked decrease in PL intensity was evident at temperatures above 32 oC, demonstrating an on-off switching behaviour of the sensor. The functionalised graphene oxide composites demonstrated excellent stability in water, opening up the possibility for their use as optical indicators of temperature change in biologically and environmentally compatible sensing systems.